Freshman midfielder Lina Proska chases the ball during the Colonials' 1-0 victory against American University earlier this season. Although new to the team, Proska has proven herself a trustworthy offensive threat, already scoring twice this year in as many chances. When freshman Lina Proska moved to Germany with her family as a 10-year-old, she faced plenty of challenges, like learning an unfamiliar language and acclimating to a new way of life. But the time was transformative, helping the midfielder embark on an unusual journey to discovering her passion: soccer. “When I moved to Germany, I could not juggle a soccer ball and then, after those three years, my record was 1,203. I think that if I did not have that experience I would not be the same player that I am today,” Proska said. Now starting in her first year for the Colonials, Proska continues to improve her strength and physical fitness, while attributing her learning of the fundamental “nuts and bolts” of the game to living in Europe. Through just six games for the Colonials this season, Proska has emerged as an offensive threat, starting all six games and scoring on both of her two attempted shots. Her play has earned her four total points – second on the team. In Germany, Proska embraced the challenge of adapting to a new culture while simultaneously learning to play soccer. In those three years, Proska played on an international team in the Olympic development program and even competed on a boys’ team, “which helped me to be physical on the field and taught me that if they push me around a little bit, then that is okay,” she said. Her father, Daniel Proska, said Lina quickly earned the respect of her male teammates. “You know 10-year-old boys, they wouldn’t pass her the ball because she’s a girl, and I remember one game she finally got the ball and dribbled up the field and shot and scored. And after that they gave her the ball a little bit more,” he joked. Even though her teammates and coaches did not speak English well, she acquired the skills necessary to become a forward on a Division 1 soccer team. Those skills have translated into tactical play and attention to detail, as Proska has adapted to transferring the ball-handling and finesse skills she learned in Europe. During her four years at Chapman High School in New Jersey, Proska was a three-time New Jersey All-State selection and was named All-Morris County Forward of the Year in 2011. “American-style soccer is also very physical. I was not really prepared for that, because they focus a lot on possession in Europe, and I kind of brought that style to my club team in the U.S. I had to learn to be more aggressive on the ball,” Proska said. It’s training like that – and learning how to do more “besides kicking and running,” Proska said – that has helped her compete and make an impact at GW. The Colonials currently stand at 2-2-2, and have stayed competitive mostly because of the freshman class, including Proska. Combined, the freshmen have accounted for 10 of the Colonials’ 21 points, and four of the seven goals. 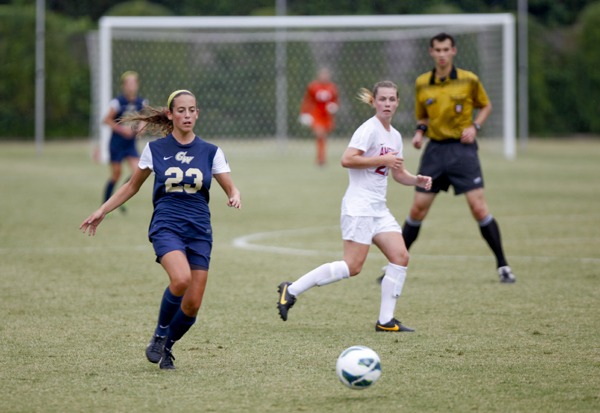 When head coach Sarah Barnes was putting together her recruiting class for the 2013-14 season, she prioritized finding players like Proska, who could be the difference on the offensive side of the ball. Barnes said Proska’s success thus far is a testament to her time in Germany, and her focus on the mental side of soccer. Nick Ong contributed to this report.